Emulating an antique, this polyresin table lamp boasts a bulbous amber body with pinecone details. 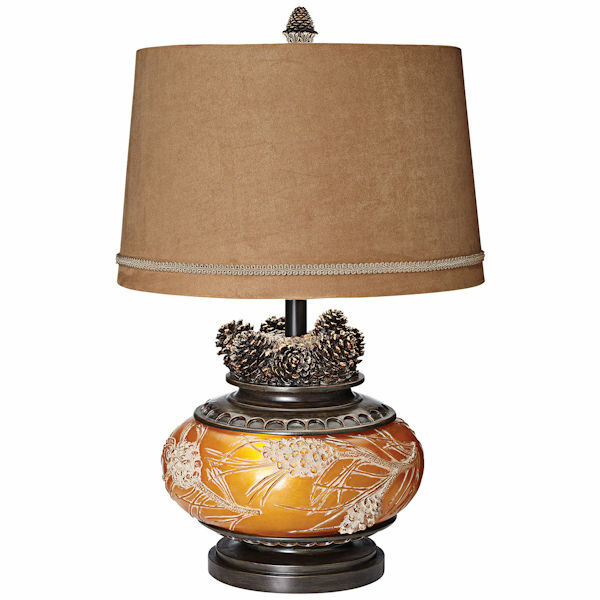 With a chocolate pine faux suede tapered drum shade (10" high) on top, this lamp is adorned with a bevy of realistic woodland pinecones. Nightlight option inside the base gives low light for when you want ambiance only. Lamp 26"h x 16"l x 16"w. Takes 1 medium base bulb, 150 max wattage (and a nightlight bulb). Please allow 2 weeks for delivery. No rush delivery or gift box. Item can only be shipped within the Continental US.